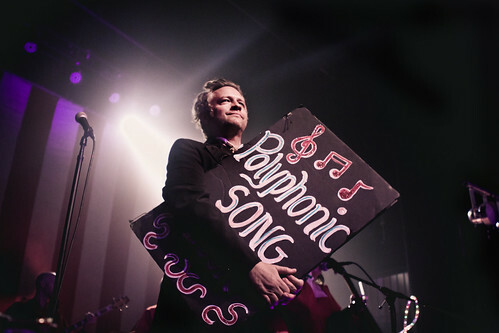 Santa, along with the Mrs., Frosty, Rudolf, and some magical elves, all came a few weeks early to celebrate the holidays with The Polyphonic Spree at the Fonda Theatre. Song books were handed to fans as they walked in. The multi-instrumental symphonic pop-rock band/choral continues its tradition of a holiday-themed show for all ages, now celebrating its 10th-year anniversary. The aptly-named “Holiday Extravaganza tour,” comes with complete holiday decorations, mascots, balloons, confetti cannon, snow machines and anything that you can think of that turned the venue into a Christmas wonderland.